Trekking through the Himalayas, meditating by sacred lakes, trying new foods and meeting new friends: talk about an adventure! Our Life Vision Academy seniors had the field trip of a lifetime this April. Our 16 oldest students, accompanied by 5 of our staff members, made their way from our campus in Lalitpur to Pokhara, Marpha, Jomsom, Kagbeni and Muktinath! The kids designed the entire concept, naming the trip "CYF Chasing the Himalayan Candy: Series 1." Their goal was to collect the version of what candy is to kids they met on the way, while also collecting stories of all the places they visited to share with everyone in the CYF community. 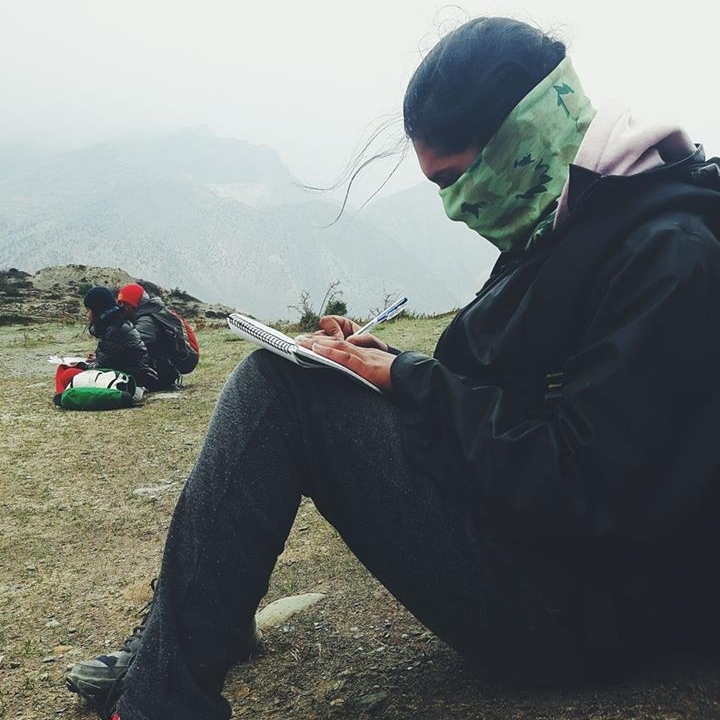 Our student Dilip wrote a journal about the trip, and we took a lot of photos to share with you. Keep reading to see our journey through his eyes! Making this dream trip a reality was a collective effort all thanks to the sponsors who donated. Thank you - we are so grateful! The trip is named Series 1 because we are hoping to make this a tradition for LVA students for years to follow. To sponsor kids for an adventure next year, donate here! We woke up early in the morning at 5:30am. I was really excited because it was the first day of our trip. Being very happy, I brushed my teeth, washed my face and ate my breakfast. I changed my dress around 6:15am. Our van arrived at 6:45am. We went to pick up Haushala ma'am, Anurag dai, Matthew dai and Justin dai. We went and changed our vehicle in Kalanki. We all put our belongings in the tourist bus, then our journey began. We had a lot of fun singing and joking with one another. The bus stopped at Damauli to give us time to eat lunch. We ate our lunch, went to the toilet and climbed back in the bus. We reached Pokhara around 3:30 PM. The bus took us a little farther than our hotel, so we had to carry our belongings to our hotel (Noor Hotel). We went to the lakeside and ate our snacks. After some time we went to Godfather's Pizzeria and ate our dinner. We ate pizza. After dinner we came back to the hotel and watched TV for a while. Then we slept. We woke up at 6:00 AM. We got ready for our breakfast. We ate our breakfast. After that, three jeeps came to pick us up. We had to reach Marpha which was really far, so we left earlier from the hotel. We saw rivers, hills, hydropowers, caves, wild honey hives, etc. We saw Kali Gandaki River also. We stopped in a place to use the toilet. We bought snacks at the same time. After some time we stopped in Beni Bazaar to eat our lunch. I was feeling very bad because I was about to vomit so I didn't eat lunch. I ate chowmein and Sprite. Then we moved ahead. We stopped again in the Tatopani hot springs. We took a nice hot bath. It was really fun. In Tatopani there was Hotel Annapurna where we ate our lunch but only the students who didn't eat in Beni Bazaar. We kept moving. We reached Marpha at 6:00 pm. We washed up, then we ate our dinner. We celebrated New Year and Meena's Birthday in Hotel Marpha Palace. After eating we played for a while and we went to sleep. We woke up at 8:00 AM because it was a short walk from Marpha to Jomsom, just 6 km. We ate our breakfast at 8:30. We also did meditation with Haushala ma'am. Before we reached Jomsom, we visited the Sumtangling Monastery in Marpha which is 300years old. Monk Dhendup was very nice to share the history of this beautiful place. We didn't go to Jomsom in the Jeep. 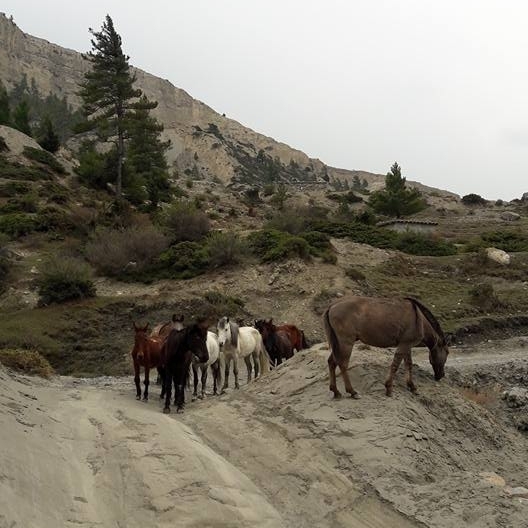 We walked but the Jeeps would wait for us in Jomsom. When we walked we saw many things like rivers, mountains, jurlunge pool, fossils, gumba (monasteries), horses etc. Anurag dai bought me a Buddhist hand band which cost Rs 200. We took many pictures also. We saw a very big vulture just in front of us. We reached Jomsom early. We ate our lunch and rested for a bit. We were about to go for the trek but it rained so we stopped. After fifteen minutes we moved. We went to Bara Barse Mela in Thini. We danced there. After that we went to Dhumba Lake and meditated and journaled for a while. Then we moved back. We ate noodles on the way. We returned to Xanadu and ate our dinner. Then we slept. I was sleeping very well. But Anurag dai came and woke us up at 6:30 AM to show us a beautiful view of the mountains because it had rained last night. After that we packed our dress and ate our breakfast. After that we started to walk to Kagbeni. On the way we found many fossils. We took a shortcut which was the river way. We reached another hotel in Kagbeni named Yac Donalds easily. We ate our lunch and rested for an hour. After rest we visited another gumba in Kagbeni which was 500 years old. We also saw a sculpture of Ganta Karna. We also took a short walk with Anurag dai. After that we returned to our hotel. We played a funny and interesting game with Anurag dai and Haushala Ma'am. Anurag dai told us we could reach Dolpa, Upper Mustang, Domangthang, Muktinath etc from Kagbeni. After that we ate our diner and went to sleep. We woke up at 6:00 AM. We packed our clothes and ate our breakfast by 7:00 AM. The weather was very cool. We moved at 7:00 AM from the hotel Yac Donalds. It was fun walking but we got tired very fast because of lack of oxygen in higher altitude. But the views of the mountains and hills were so amazing that I didn't want to close or wink my eyes. We took many pictures on the way. We ate snacks in every break that we took. I was hoping to touch snow but it was in higher altitude. We reached Muktinath at 3:00 PM. We took baths in 108 taps and swam in two square ponds. We went inside after taking baths. Haushala ma'am put us tika and dora. After that we ate cooked noodles in the restaurant The Path of Dreams. After that we came back to Jomsom in the Jeep. We reached Jomsom within 1 hour and 30 minutes. After reaching Hotel Xanadu we had tea and biscuits. We rested for a while then we ate our dinner. After dinner we played the same game that we played in Jomsom. It was really exciting moments that we were all having. After the game we slept. We woke up at 7:30 AM. We ate our breakfast and moved from Jomsom in the Jeeps. We all were having a Jeep race. It was fun encouraging the driver dai to increase the speed of the Jeep. We didn't stop in many places because we had seem them before when we went there. We stopped in Hotel Annapurna and drank cold drinks. Then we moved ahead again. After some time we stopped in Beni Bazaar at Yak Hotel to eat lunch. We ate chowmein. After chowmein we ate ice cream also. After that we again moved. We stopped at a waterfall. We played there for a while. We played with water and took pictures. When we finished visiting we kept moving. We reached Hotel Prime at 5:00 PM. We took showers and watched TV for a while. We ate dinner in the hotel Tea Time. I ate a crunchy chicken burger. I also helped others to eat. After eating we came back to the hotel. We watched TV for a while then we all slept. We woke up at 8:00 AM in the morning. We packed our belongings and went to Hotel Iceland. Hotel Iceland was a very expensive and advanced hotel. The hotel had many facilities like: 1) Television 2) Air conditioner 3) Swimming pool 4) Room attached bathroom 5) Tea in room 6) Freeze 7) Cupboard, etc. We kept our clothes in the hotel. We went to PHAT KATH to eat our breakfast. It was Anurag dai's friend's restaurant. There was a snooker table also. We enjoyed playing with it. After some time we ate our breakfast. After breakfast we went boating. We went to the Peace Stupa, Haushala ma'am's house and a temple that was in the middle of Fewa Lake. We did boat racing also. After boating we came back to Hotel Iceland. We went swimming for a long time. We ate snacks because we felt hungry so fast after swimming. After a while we went to a hotel and ate dinner. We also ate ice cream. After that we came back to the hotel and slept. We woke up at 6:30am. We packed our clothes and ate our breakfast. The bus was waiting for us so we reached there by 7:15 AM. We all kept our clothes inside the bus then we moved ahead. We were enjoying the jokes and memories that we had the last seven days. It was fun talking about funny things. We stopped in a hotel to eat lunch. We ate non-veg lunch. After eating we climbed back on the bus. We caught a van in Swayambhu. The van brought us back to our hostel. 7) The unity of our CYF family. Helping, caring and aways searching for one another. For more photos from our trip, follow us on Instagram @cyfnepal! Newer PostOur Three Oldest Students Excel at SLC Exams!